OttLite Freestanding Magnifier - The Freestanding Magnifier delivers hands-free viewing and up to 5x optical-grade magnification. The rimless lens includes a spot magnifier, and the sturdy yet flexible arm is perfect for viewing intricate details on the smallest flies. The perfect accessory to complement the OttLite 18w Table Lamp. OttLite 18w Table Lamp offers powerful illumination and total flexibility. Ideal for tying on tables, countertops and work benches. Shade height and angle can be easily adjusted with one hand using the flexible neck. By delivering the right mix of brightness and contrast, OttLite Illumination lets you see colours and fine details of what you are tying with ease. 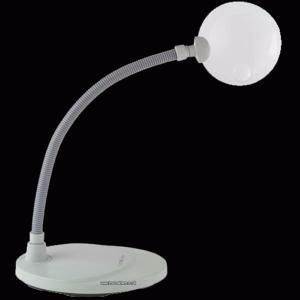 The daylight bulb gives a true reflection of colour with low heat and glare which will reduce eye strain. 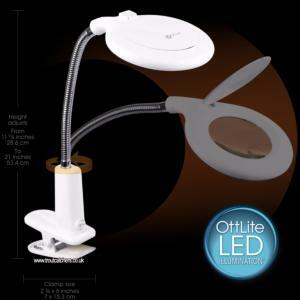 OttLite LED Clip-on Light & Magnifier - a magnifying lamp and then some! Optical-grade magnification with 360 degree OttLite LED Illumination helps you see details of the fly you are tying ultra clearly. 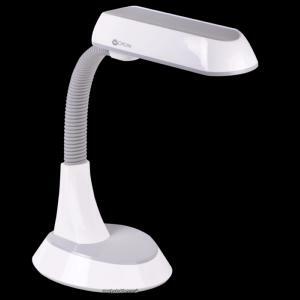 The flexible neck directs illuminated magnification right where you need it while the sturdy clip attaches firmly to desks, workbenches and more. Featuring a 1.75x magnifier lens with a 4x spot magnifier, the flip shade closes to protect the magnifier when not in use. With OttLite you can see the minute details clearly. 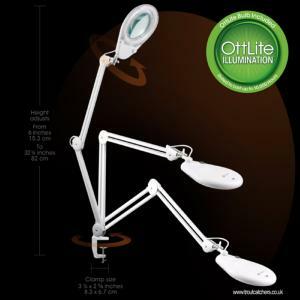 OttLite 22W Crane Light & Magnifier - The ultimate tool for the serious Fly tyer. The 22w Clamp Magnifier brings the best in OttLite illumination combined with an optical-grade magnifier. The sturdy and versatile clamp attaches to desks, workbenches, tables, and much more. Features an articulating arm and rotating head with 360 degree illumination for precise viewing and angle placement. Flip shade closes to protect the magnifier when not in use. The perfect magnifying lamp for fly tying!